Rise and shine! Trendy Entertainment has released “The Harbinger Awakens,” the latest major content update for the action tower defense game Dungeon Defenders II. Three new and returning maps, as well as a thrilling boss battle aboard an airship against an old foe lurking in the shadows since the original Dungeon Defenders. Winter has come to the magical realm of Etheria, bringing with it snowy maps and special winter lockbox drops containing time-limited accessories like Santa hats, reindeer horns, chances at standard and holiday-themed costumes, and more. The path to level 50 is now significantly faster, and with the endgame content level requirement reduced to 40, players can hit endgame content even sooner. Loot drops have been reduced, but items now drop at higher qualities and specifically for the heroes players are using, with stats and passives targeted to particular builds. Shops now generate items directly relevant to a players’ active hero. In addition, “The Harbinger Awakens” introduces new legendary galactic weapons, including the Squire’s Crystalline Saber, Monk’s Crystalline Twin-Blade, Huntress’ Bow-Blaster and Apprentice’s Blaster-Caster. 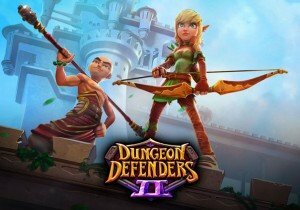 These items will be unlocked in tiers as permanent drops in-game as more players join the official Dungeon Defenders II Steam group at http://steamcommunity.com/games/236110. Tales of Pirates 2 is preparing to launch a new version, The Grand Line.